FTP is similar to using Windows Explorer to move files around. Basically you need to take the ".htm" files , and images, you have made, and transfer them from your computer to the computer acting as the server for the web site. Its called a server because when the viewer calls up the page, the host "serves it" so it can be viewed. One of the most popular reason why you cannot see something on a web page is because the file you are looking for, has not been properly FTP'd to the server. The following terms and phrases in Chpt 4 may be recognizable to students who have gone through the process of setting up their computer to send and receive e-mail, but perhaps you entered these terms into profile boxes without knowing what they mean or what role they play.
. In order to make good web pages, you not only need to create the words, but also shape and move images around. Some images are ones you create, other images are scans of photos and diagrams. 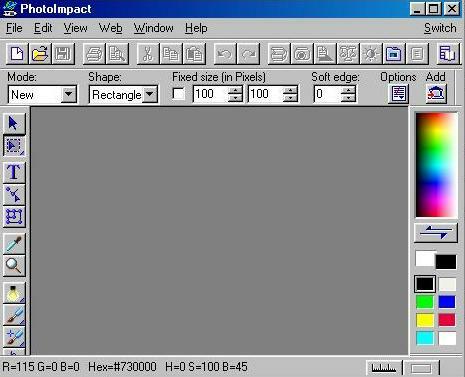 Having access to, and being able to competently use a image package, such as Photoshop, is critical to putting together an attractive site. - Graphics Equipment and Imaging Software. 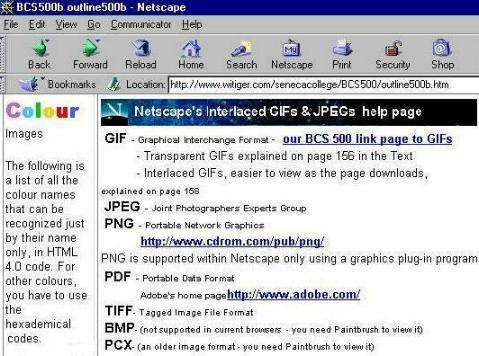 FYI, many web page authoring software packages also contain image editing software on the CD, eg. GIF is best when you have people accessing the image who have fast computers and a good connection. GIF formats take up more space than JPEG and as a result there is a better rendering of the image because it uses more pixels. Prof. Richardson teaches a courses titled "Advanced HTML" at another institution. In one section of this course (which is also online) there is a lot of material about images and audio to web pages. Rather than cramming that content into this MGTC50 page, you are encouraged to click on the screen captures below and go to that other site. . . In addition, you are encouraged to read Chpt 4 in the i-NET+ Guide (2nd ed.) (Chpt 5 1st ed.) since it has some very good explanations, including instructions for putting images and audio on your pages.
. In considering the addition of audio and visual content to a working e-commerce site - which you are understanding to build for MGTC50 - it is important for you to know the limitations of the average person browsing your site. For example, if you have an intro page with a kewl "flash" image, and many of your visitors do not have a flash plug-in, then you have to provide an alternate entry page. Knowing about the latest image and sound applications, and marrying this with an understanding of the browsers used by typical visitors to your site, will allow you to create a total "experience" that loads quickly, and is interesting and informative. Understand that adding sound to your web site is a relatively new feature of sites since most people accessing the web have had speakers on their PCs less than 3 years. 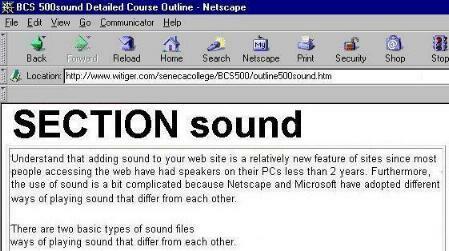 Furthermore, the use of sound is a bit complicated because Netscape and Microsoft have adopted different ways of playing sound that differ from each other.
. Why did we spend a particular amount of time in MGTC50 talking about sound on web pages --- because from 1997-2001 - which is the early period within which most people started accessing the web - most of the content has been in text and image form - it is expected that in 2003 and beyond, that more content will be in audible formats to allow delivery to cell phones, and other instruments - therefore the reason you should know about, and be aware of sound on the WWWeb. A short one page on some of the issues. "Domain names are an alternate way of addressing a host on the Internet [instead of using numbers], but all domain names eventually must be mapped to a host's IP address before contact with the host can take place. Think of a domain name as an alias; the real name of the host computer is the IP address".
. Try this, click on both links, they both go to the same web site. One link shows the domain name as a word, the other as an IP address. 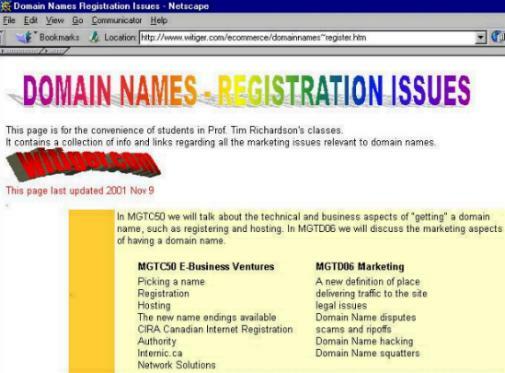 "How to Create and Update a Domain Name"
http://www.witiger.com/ecommerce/outlineMGTD06b.htm - since that course is about the marketing and strategy of e-business whereas MGTC50 is primarily about the details of building a working site. However we cannot begin MGTC50 without a basic intro to business models - even if it will be discussed in detail later in MGTD06. We need some basic understanding of business models so you have a framework within which to build your "solution". As we can see form the list above, the variety of e-business models is as extensive as the variety of brick and mortar stores - that is to say by 2001, there are many many ways of making something, and selling it to other people.